John Krissilas / Writer, Thinker, Storyteller: Dead Duck! And now for the action! In previous Write Like Fleming entries, in which I delve into the writing style of one of my favourite authors, Ian Fleming, we've explored Fleming's flair for building tension (with... tension) and building characters (with reflections and nostalgia). In today's entry, number 006, we'll see how Fleming combines all of the above within an action scene. When we last left Bond, in "The Living Daylight's" interview with M, Bond is given a dirty assignment: kill the KGB sniper called "Trigger" before Trigger can shoot down a defector, Agent 272. 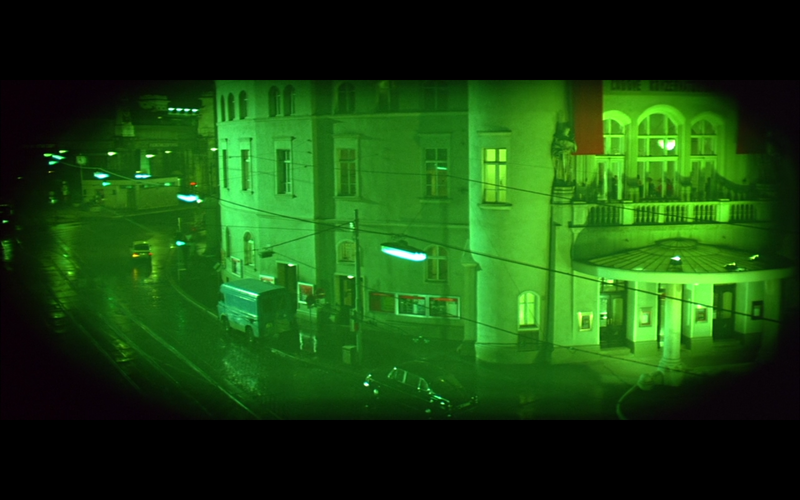 Now, at the climax of the story, we find Bond staring through his sniperscope at the No Man's Land between East and West Berlin. Agent 272 has finally made his move — running full tilt for the border. But Trigger's made his move, too — finally showing his (?) face in an East Berlin window. Creates a multi-sensory experience: sights, sounds, feelings, from Bond's partner screaming updates to bullets crashing to the sudden, fleeting glimpse of Trigger in the window. Uses long sentences to create a sense of chaos: things happen so fast there isn't even time for a period! Mixes in Bond's thoughts: even in the middle of a firefight, Bond has flashes of internal dialogue as he moves from shock to rationalization to a sense of wonderment and melancholy. James Bond felt the sweat pouring down his face and neck. He took a chance and quickly wiped his hands down his sides and then got them back to the rifle, his finger inside the guard, just lying along the curved trigger. "There's something moving in the room behind the gun. They must have spotted him. Get that Opel working." Bond heard the code word go into the microphone, heard the Opel in the street below start up, felt his pulse quicken as the engine leaped into life and a series of ear-splitting cracks came from the exhaust. The movement in the black cave was now definite. A black arm with a black glove had reached out and under the stock. "Now!" called out Captain Sender. "Now! He's run for the wall! He's up it! Just going to jump!" And then, in the sniperscope, Bond saw the head of Trigger — the purity of the profile, the golden bell of hair — all laid out along the stock of the Kalashnikov! She was dead, a sitting duck! Bond's fingers flashed down to the screws, inched them round, and as yellow flame fluttered at the snout of the submachinegun, squeezed the trigger. The bullet, dead-on at three hundred and ten yards, must have hit where the stock ended up the barrel, might have got her in the left hand — but the effect was to tear the gun off its mountings, smash it against the side of the window frame, and then hurl it out of the window. It turned several times on its way down and crashed into the middle of the street. "He's over!" shouted Captain Sender. "He's over! He's done it! My God, he's done it!" "Get down!" said Bond sharply, and threw himself sideways off the bed as the big eye of a searchlight in one of the black windows blazed on, swerving up the street toward their block and their room. Then gunfire crashed, and the bullets howled into their window, ripping the curtains, smashing the woodwork, thudding into the walls. Behind the roar and zing of the bullets, Bond heard the Opel race off down the street, and, behind that again, the fragmentary whisper of the orchestra. The combination of the two background noises clicked. Of course! The orchestra, that must have raised an infernal din throughout the offices and corridors of the Haus der Ministerien, was, as on their side the backfiring Opel, designed to provide some cover for the sharp burst of fire from Trigger. Had she carried her weapon to and fro every day in that cello case? Was the whole orchestra composed of KGB women? Had the other instrument cases contained only equipment — the big drum perhaps the searchlight — while the real instruments were available in the concert hall? Too elaborate? Too fantastic? Probably. But there had been no doubt about the girl. 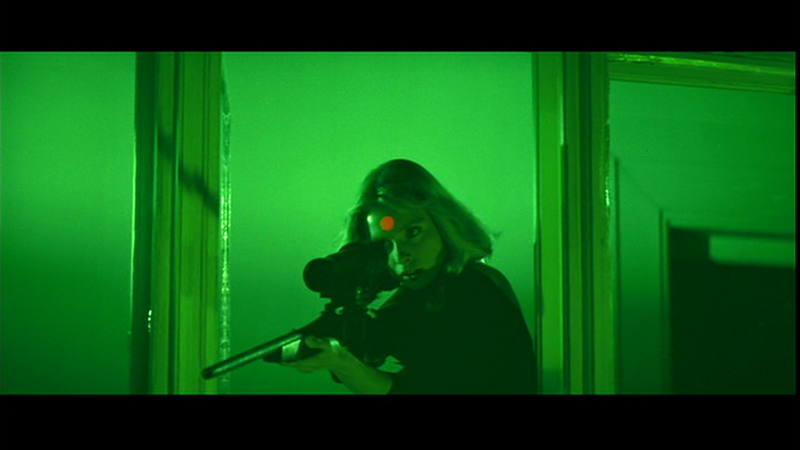 In the sniperscope, Bond had even been able to see one wide, heavily lashed, aiming eye. Had he hurt her? Almost certainly her left arm. There would be no chance of seeing her, seeing how she was, if she left with the orchestra. Now he would never see her again. Bond's window would be a death trap. To underline the fact, a stray bullet smashed into the mechanism of the Winchester, already overturned and damaged, and hot lead splashed down on Bond's hand, burning the skin. On Bond's emphatic oath, the firing stopped abruptly and silence sang in the room. What do you think? Do you feel like you were right there, with Bond, staring through that sniperscope?